Last Saturday, November 3, 2018, will go down in Ghana’s history as a memorable day for Ghana Sports as the Prince of Wales, Prince Charles and Camilla, the Duchess of Cornwall, embarked on a visit to James Town, close to Bukom, the cradle of Ghana boxing. The emotional tour, which formed part of a four-day visit to Ghana, began at Jamestown in the heart of the capital, Accra. The visit was largely seen as a good omen for Ghana sports, especially, as the wife of the Vice-President, Hajia Samira Bawumia, gracefully escorted the Royals through a cocktail of art, music and dance in the fishing community of British Accra which used to be the dwelling of their forbears and is symbolised by the ancient fortress of the James Fort along the beach. On their arrival at James Town which is the hub of Ghana boxing, Prince Charles was proudly met by two great sons of the land — the legendary Azumah Nelson, of the Boxing Hall of Fame and three-time world champion, and the current World Boxing Organisation (WBO) super bantamweight champion, Isaac Dogboe. While the Royals enjoyed the company of Azumah Nelson and the ‘Royal Storm’ Dogboe, they were entertained on the sidelines with a splendid boxing exhibition which was interspersed with some breathtaking acrobatic display. Though the audience could hardly get the import of what transpired between The Prince of Wales and the two great champions, observers believe the conversation might have bordered on the achievements of boxing in the country and Prince Charles’ impressions and future plans to help grow the sport. 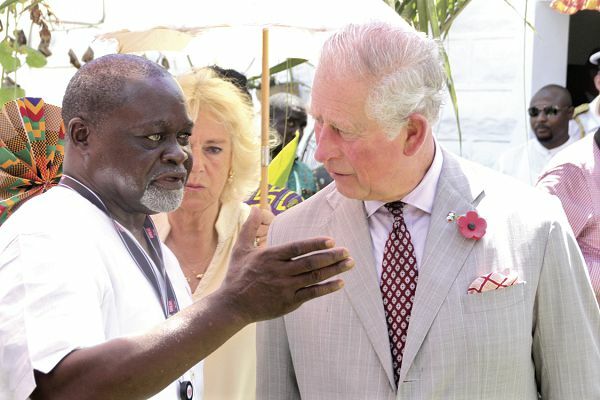 As Prince Charles and Camilla returned home on Tuesday, it is the expectation of Ghanaians in general, and the sporting fraternity in particular, that their historic visit to James Town will translate into the construction of another mega sporting facility similar to the state -of-the-art Bukum Boxing Arena and similar support for the other disciplines to immortalise their names for posterity .